If there is anything you are not satisfied with about the stronger CNC machine, tell us here! Hi, poundteam? (Hmmm. It’s strange nickname) I am David, from Snapmaker. According to plan, we want to build this big buddy to mill metal. BTW, I am a software engineer. Good to meet you here. Since there is (in fact) more than one of us here, it seemed appropriate to avoid ambiguity (by adding some). It may be one of three people who will have access to the 3D Printer while we work out cool ways to make $$ with it (which won’t be any fun at all, of course, since this is a very serious work place). I’d be much more impressed with a Laser that was capable of marking metal. That would get my attention. We will accumulate knowledge to build more serious tools. But from my perspective, a Laser that was capable of marking metal is not a short-term goal. We might need more funds and recruit more talents to achieve that. I guess. (PS: I am only a coding guy). In one of my earlier lives (a decade ago), I worked at an executive gift facility. They outsourced the laser/CNC and Etching work. But then it all turned into laser (98% at any rate). And we purchased two of our own lasers. I ended up managing a team that (in the end) out produced all our suppliers, who had 6-8 lasers between them. With our … two. The driving force behind that evolution now works with me at my new company, which is all computers and software. When this device becomes available, her job will be to see if we can (in any way) monetize this device. Even if it’s only minor, or even a cost-savings tool for other departments, she’s definitely looking forward to getting her hands dirty. Primarily because she creates costumes (with robotic inclusions…) as what will be a spinoff soon. Hmm, I am not sure I am getting your points. You are saying that lots of artists will need a handy Laser Cutter/ Engraver to help them create their own business. Products can marking in metal will help individuals achieve that. Am I right? More like: When we get there, I’ll be very happy. And ready to use the tech to make money. In the meantime, let’s see if we can make money with this version. Even if we don’t, it’ll be fun trying. Let’s take it step by step. A laser has that kind of power need extra safety protection. I think https://glowforge.com/ is a good one~ What do you think of glowforge? Overkill, in a way. But would be brilliant if that level of laser were able to be combined with SnapMaker (even if purely as an add-on). My ultimate goal would be to Mark metal (not cut, that’s a pipe dream) without pre-treatment and without a water circulation cooling system. However: Laser is the secondary use for the system for us. We’ll be using it first (most likely) to prototype encasements for electronic controls. Good to hear your feedback. It’s important to us. We will collect more advice, and discuss more detail with our engineer after they return. (Some best of them are camping out factories to make sure timely delivery and quality). I am wondering what your new, improved stronger CNC machine will be able to cut? Aluminum? Brass? Any chance of it doing steel? Thanks for your wonderful work so far. We are trying Aluminum now. Brass and steel may be the next targets. I’m not sue if the linear modules and CNC head can withstand the higer axial and radial loads. The machine should just engrave on metal I think becaus for a real CNC mill it will be definitely to weak. Also you will be missing a cooling for the cutter bit. This would be more like a toy for marking objects but not for creating a CNC part. But I’m also with poundteam and the wish for a laser for marking metal (INOX and aluminum would be mandatory for such a tool in my opinion). A comment about CNC cutters, just like the old adage that a “chain is only as strong as it’s weakest link”, a CNC cutter is only as good as it is STIFF. The double Z stiffens that axis but then there are still two others that aren’t stiff. With your current actuators, you just about need a dual actuator for every axis. One suggestion is that instead of a second actuator for each axis, have a separate “guide” (preferably ball bearing slide) to stiffen that axis. This is one area where the nock off 3D printer Mooze is perhaps stiffer. Mass also helps, the more massive it is, the less it can easily move (vibrate). It may be that simply adding a fly wheel to the motor will help to smooth out the tool vibration. Snapmaker should consider implementing a collet for the CNC and perhaps even use Dremel brand collets. Which brings up an Idea, have a forum topic for related products that folks might want to purchase. 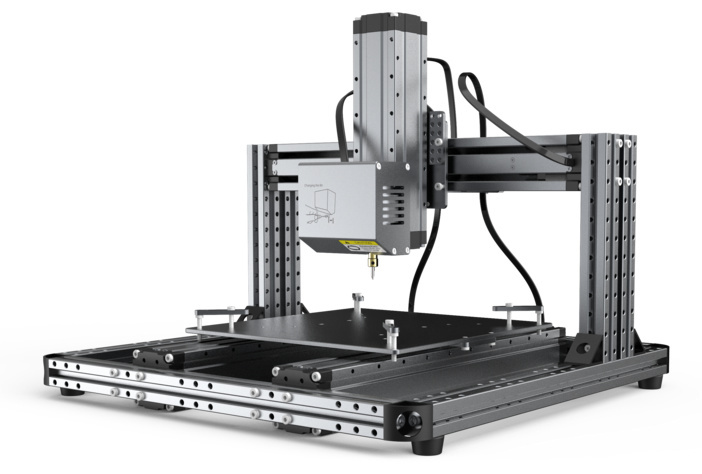 The CNC carving module only supports 1/8" (3.175 mm) collets. In the next version, we are planning to use a more expandable design to allow collets with different sizes. It appears that you have a simple brass sleeve that adapts from the motor shaft to the 1/8" cutter. Does that sleeve just mount to the motor with a set screw? It is mounted to the motor using a coupling. Coupling, sleeve, same thing. The question was: is it mounted by a set screw? Or perhaps it’s pressed on?